Porsche Design’s, um, design is almost always easily predictable. In this regard the German brand reminds me of Apple Computers as it was when Steve Jobs was in charge. Their design language is well developed and highly articulated, and thoroughly calculated: they never seem to leave anything to chance. It looks like nothing is added or subtracted just because an executive board or some guy in a room full of computers decided to “play a little” with additional elements just to make the piece “look more, um, complex, you know”. I don’t know how many iterations of their new timekeeper (and other objects of industrial design) they sculpt from Styrofoam before giving it a final go ahead, but it seems that, well, a lot. Every single element of the case, including the oversized setting crown, looks like the brand has invested thousands of man-hours creating this work of art. And don’t let the seeming simplicity of the piece full: it is that rare case where it takes more effort to make an object look simple than to make it look complex. As usual, the watch looks very elegant in that reserved way we came to like since the German brand Braun has delivered its first product designed by Dieter Rams. On the photos above and below you can see that the timekeeper’s titanium case seems to feature a unique “unibody” design with only its back cover screwed-down with eight polished screws. 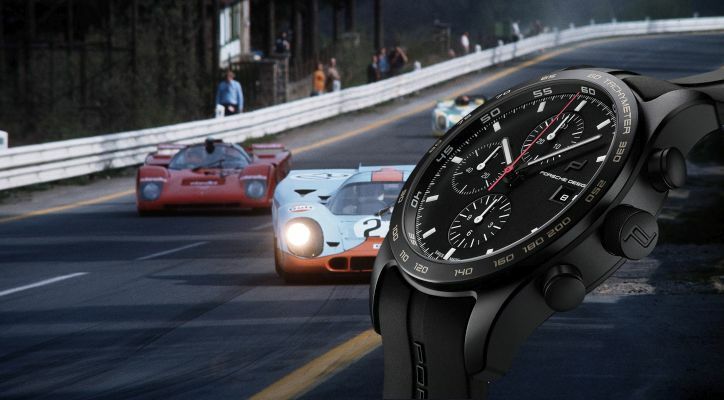 The matte black dial, too, offers a completely flat surface, which is decorated with twelve rectangular hour markers and a seconds/minutes scale, which is echoed by very vintage-looking 12-hour and 30-minute chronograph and small seconds sub-dials located at 6, 12 and 9 o’clock respectively. There is no guilloche, no meticulous skeletonization, no complex three-dimensional surfaces, but nevertheless the face of the gadget looks absolutely, unquestionably stunning with the thin bezel with its usual tachymeter scale serving as a perfect frame for this picture. The legendary ETA Valjoux 7750 automatic movement was, too, extensively modified. 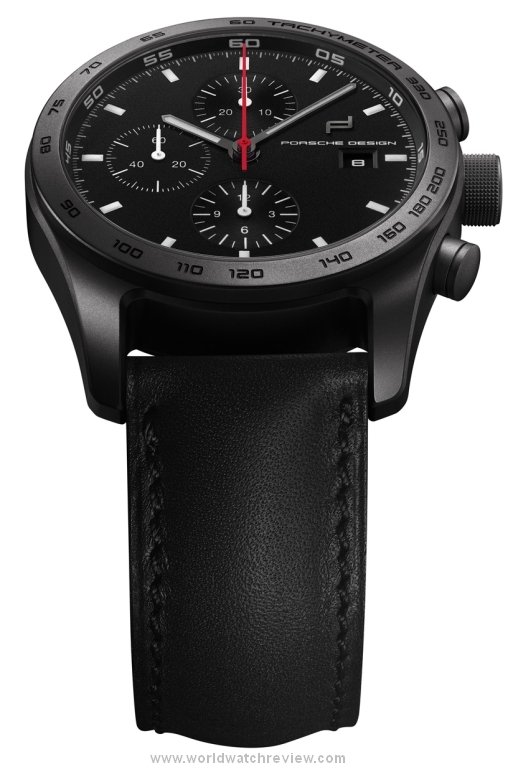 Hidden behind a black tinted sapphire crystal, the mechanism has all of its visible parts blacked out and decorated with Geneva Stripes, while its original oscillating weight has been replaced with a new part that features the famous “Porsche Design Icon” logo (it is also visible on the dial and the oversized setting crown). Measuring almost 15 millimeters thick, the wristwatch is obviously not for the kind of persons seeking for ultra-slim timekeepers, but I still can’t call it too thick: for timepieces powered by the Caliber 7750, this is a pretty normal size. Just make sure that your shirt has wide enough cuffs to accommodate this beautiful monster.